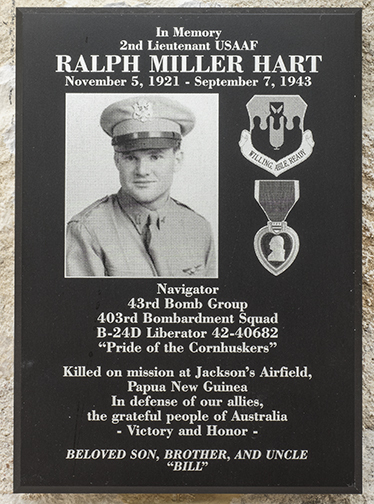 As we here in Australia we continue to search for the remaining U.S. descendants we have not yet been in contact with, the family of 2nd Lt. Ralph Hart, with the cooperation of the National Museum of the Pacific War, have made lasting tribute to the Americans and Australians whose lives were lost or forever affected by the crash. Friday 18th July 2014 I received an email from the United States. It was from a lady that had started to research the death of her husband's uncle during WWII. It turned out that uncle was Lt. Ralph Hart, the Navigator onboard USAAF B-24D 42-40682 'Pride of the Cornhuskers'. 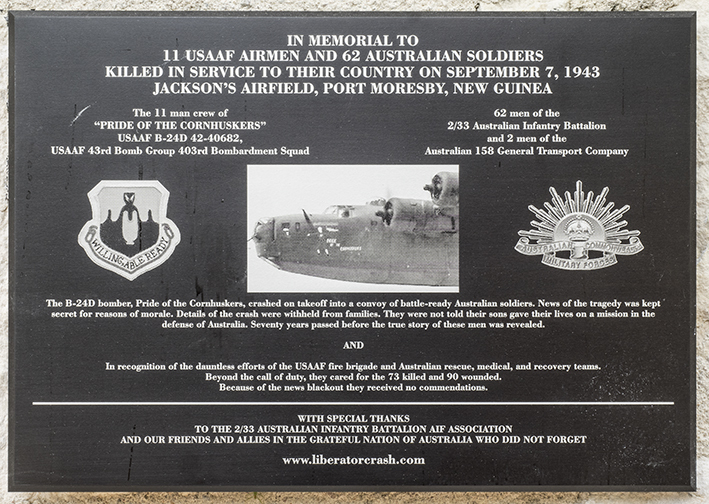 Lt Hart's brother, a retired WWII USAAF veteran, had not known the circumstances surrounding his brother's death due to the strict military censorship at the time. Working together with Bill Hart, nephew of Lt Ralph Hart, we have been able to provide information surrounding the crash and try to offer some closure on those unanswered questions. Working with the Admiral Nimitz Foundation, the Hart family commissioned two memorial plaques. They express the family’s gratitude to the men and women who cared not only for Lt. Hart, but for all the casualties of the crash. The plaques are honorably displayed side by side as you enter the Memorial Garden of the 'National Museum of the Pacific War' in Texas.